What an adorable film for the little ones! 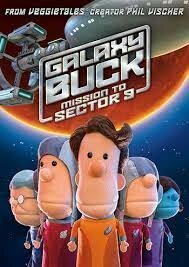 From the creator of VeggieTales Phil Vischer comes GalaxyBuck: Mission to Sector 9! It is an adorable little film with an all puppet cast who embark on quite an adventure and learn some very valuable lessons! Vischer teaches some very special things about God’s love and purpose for our lives and my favorite thing he teaches with this film is that we can all do something for God, even if we aren’t super heroes because God loves us. He even tells us how to know if we are doing that. Myself and many other adults I know could certainly benefit from this little reminder! Kids will enjoy Buck Denver’s latest adventure with his friends from What’s In the Bible? and parents will appreciate the humorous nods to Star Wars and Star Trek. GalaxyBuck communicates important Biblical truths that will add to everyone’s faith foundation, whether a life-long Christian or a new creation in Christ. But when that chance comes and Buck finds himself leading a real mission into deep space, things don’t go at ALL like he imagined! If he’s doing what God wants him to do, why is everything going wrong?